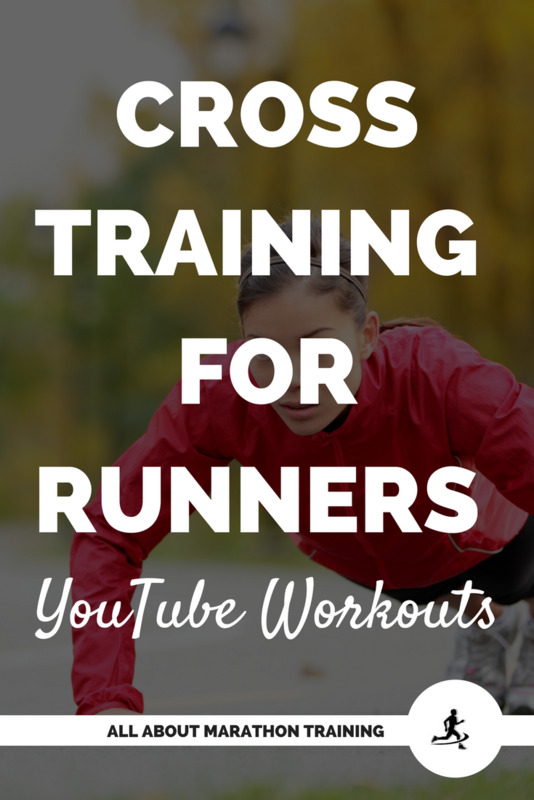 Cross training is vital if your goal is to become a healthy, strong runner. If your only form of exercise is running then you are only working part of your muscles. In order to maintain fitness you need to try and work all of your muscles - not all of the time but give them each some tender loving care. 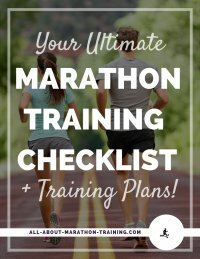 If your plan is to run a marathon you might think that you have no need to cross-train since you have so many miles a week of marathon training to do. However it is in your best interest to cross train at least once a week. 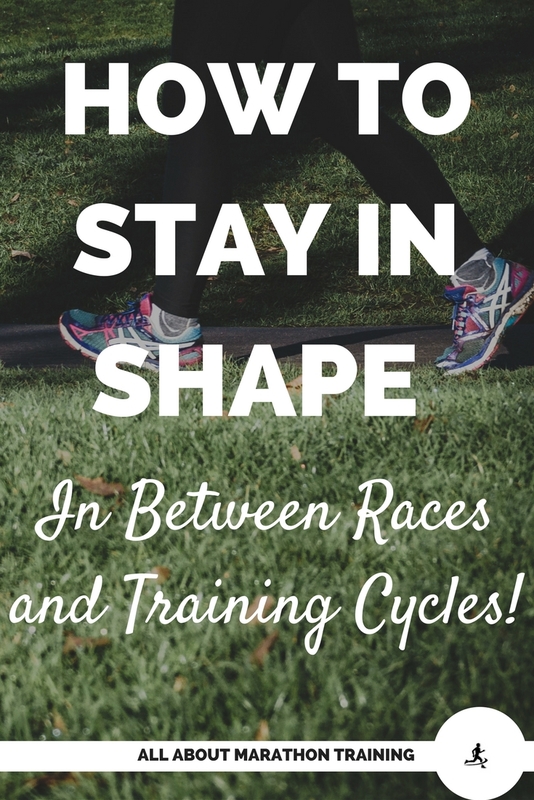 If though you find that mixing up your training interferes negatively (whether its not having enough time to cross-train or doing so would cause injury) then stay focused with your running. Can be substituted once in a while for an “easy run”. Sometimes you just don't have it in you to go out for a run. That fine. It happens. Try something else. Go for a bike ride. Lift some weights. Do some yoga. Some exercises can strengthen muscle groups that are related to and serve as injury prevention. Increases our upper body strength (very important for marathoners as your upper body can become fatigued during a marathon or long run). Can give you a new attitude towards your running especially if you are in need of some motivation. Adding something new will to your routine will keep you excited about running when you are feeling as if something is lacking. You benefit when you cross train as long as you remain injury free. Prevention is one of the best benefits of cross-training so choose an activity that will enhance your injury prevention. Everyone is different so there is no right or wrong way to cross train as long as it plays a positive part in your exercising. The best cross-training activities that runners should participate in are non –impact sports that do not place added stress on your body that you already receive through running. Bicycling – Cycling, whether on a stationary or outdoor bike is a highly beneficial way to cross train. It works muscles that are related to the muscles you use while running which gives your more leg strength, translating into more power, speed and fatigue resistance. Swimming - Swimming is mainly an arm workout since you use your arm muscles to pull your body through the water. However it is also an swimming is also a full body workout activity and is very beneficial to the body especially for marathon runners. Swimming can be very relaxing and a great way to loosen tight muscles. It is a fantastic non-impact aerobic activity and my favorite form of cross-training! Cross-country skiing - Cross country skiing is said to be as strenuous as running but it targets different leg muscles and like cycling brings to your leg muscles speed, strength and fatigue resistance. Strength Training - Lifting weights is extremely beneficial for your upper body which is very susceptible to fatigue during endurance events such as the marathon. Just don’t go overboard or you will end up with pulled, strained or stressed muscles. 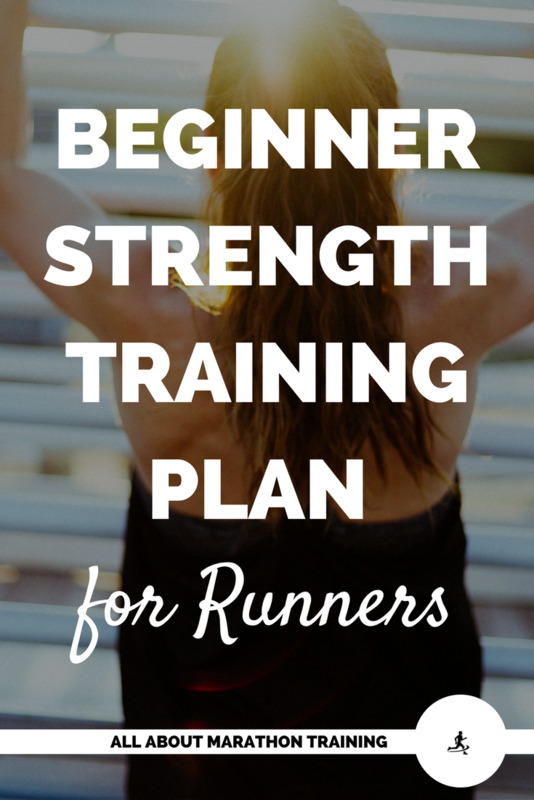 See our beginner strength program and intermediate strength program. Rowing - Rowing is an excellent all-body exercise as it works muscles from the shoulders, arms, back, buttocks, and legs. You can reap the benefits of rowing whether it’s outside on the water or inside on an egrometer (rowing machine). Power walking - is a great exercise that allows you to step it down a notch from running but also has excellent benefits! 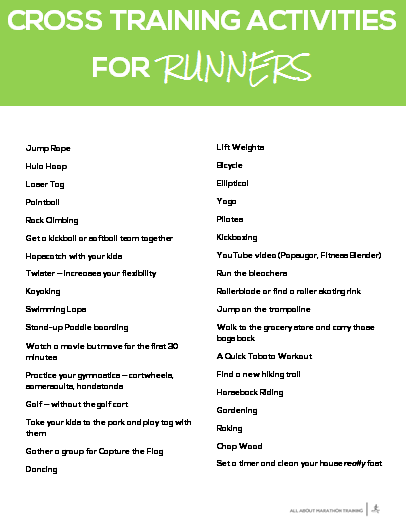 Download a free cross training activities list & keep your training fresh! Pop in your email, receive your activity list, print it off, tape it up and choose a new activity to do every week on your cross training day! those exercises that are high impact as they involve sudden starting and stopping which can be very damaging to the knees, especially a runner's knees. This doesn't mean that you have to give up these sports especially if for example you love playing tennis as I do. Just be aware that they are high impact and can do great damage so if you are in a marathon training program or want to make a certain time goal you may want to limit yourself to in how often or at what intensity you play high impact sports. One of the worse things to have happen to you when training for a marathon is having to stop when so close to your goal because you have a running injury . 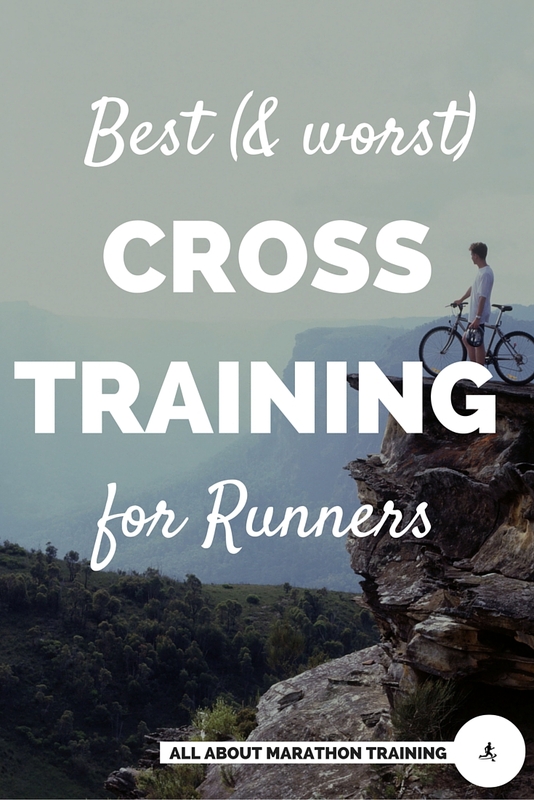 The key point to choosing a way to cross train is to make sure you enjoy doing it. Otherwise you will not feel the need or the desire to keep doing it. 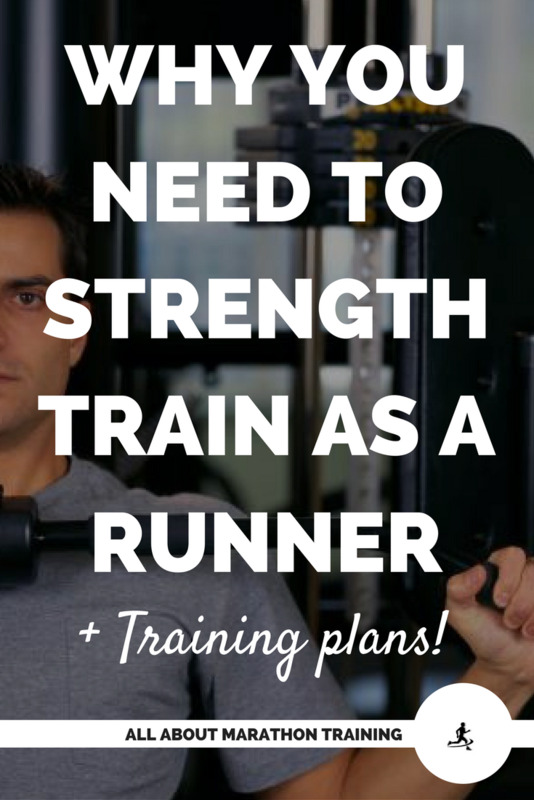 Cross-training can add a whole new dimension to your running program and make you an all-round better runner.